The Fire Training Academy’s Managing Director, Terry Gormley, agrees to challenge himself by doing the New York Marathon on November 2nd 2008 in aid of Children with Leukaemia. Terry with Lynn and Mark Whitehand at the Fleetwood Half Marathon 24th August 2008 – Half way there!!!! In the spring of 2008 I completed my greatest challenge to date – a trek to Mount Everest Base Camp! In preparation for the trek I was fortunate enough to enlist the help and skills of a personal trainer and close friend, Mark Whitehand, who helped me reach optimum fitness for the challenge! On my return Mark asked me what my next challenge would be and I told him that I was considering entering my first ever marathon – London in 2009. David was born with Cerebral Palsy* and due to his disability, he required constant care and attention. His parents had both accepted the challenge and were caring for him 24/7. David communicated with his parents and just as a mum knows her baby’s cry, Dave & Michele knew their son and loved him deeply. There were times when the family of three needed a little bit of extra help and care – this is where Bluebell Wood Hospice* at North Anston came into their own. Bluebell Wood offers respite to families in circumstances where professional help is both welcomed and needed. David’s family had a wonderful opportunity to find the support they needed to help them. Sometimes just the ability to recharge their batteries, or talk, or listen to professional guidance – having someone there when they needed them to be – all of this was priceless. As fathers, mothers, brothers, sisters or friends we can only begin to imagine what parents with disabled children sometimes have to endure and imagining is painful enough. Seeing suffering is a helpless and harrowing experience, when it’s your child, feeling despair and sometimes anger is only the part of the story. The benefits of the support Bluebell Wood offered them was ‘beyond comprehension’, liberating and giving hope and optimism to the family. Sadly on the 19th of January 2007 when David and Michelle took their seven-year-old son ‘David’ to hospital for what appeared to be routine procedure – every parent’s worst nightmare happened, when just after midnight on the 20th January ‘David’ passed away due to complications. The story of Dave & Michelle’s journey of pain & loss had begun a new chapter. Today Bluebell Wood still plays a role in David & Michele’s life. You see, after young David’s death they didn’t just leave the parents to grieve and suffer. They became involved in the support of David and Michele by acknowledging that the devastation doesn’t just go away. They gave assistance with funeral arrangements, support, basically anything they could to alleviate any of the pain that this family was enduring. 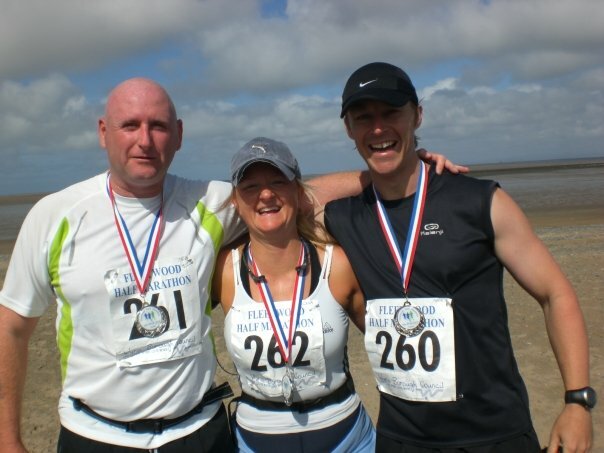 Dave mentioned in casual conversation one day one of his life’s aspirations – to run a marathon. The only way he could run a marathon and leap the hurdles of injury, work and family commitments and lack of fitness was if he had a reason to run – an inspiration. Sometimes a Marathon doesn’t seem such a task, because when you find purpose you find other things tucked away inside you never knew you had. Soon The ING New York Marathon became a firmly planted seed. A text message followed to Mark that simply read: New York Marathon on November 2, do-able? So there’s the frame, that’s how it all began. On November 2, 2008 after 26 miles 385 yards it’s just the end of the beginning. I am grateful for the opportunity to be able to join Dave on this journey, to be part of something so special. No-one more than Dave understands how we actually managed to get the opportunity to actually take part in the ING NY Marathon. Children with Leukaemia is a great charity and offered us a pathway to the dream of challenging ourselves and with the valued support of our sponsors, helping children and families who really do need our help in the future.